Have you ever wondered why sometimes you can perform at a very high level, but other times you make mistakes a complete newbie would make? Why does this happen? Become more efficient in your approach to improving. Make consistent improvement while avoiding common pitfalls. Avoid fighting a reality you can’t change. Know where a skill is in the learning process. Handle the natural ups and downs of learning better. There will be times when it feels like you have taken a huge step backward, not progressed at all, or have fallen back into old habits. The next time this happens, come back to this blog post. Understanding the concept of inchworm starts by looking more closely at the natural range that exists in the quality of your performance. Think for a moment about the quality of your performance when you are working (It could be at the trading desk, on the putting green, in the office, public speaking – anything where your performance can vary) and how they can vary. In other words, how good do they get when you’re performing well and how bad do they get when you are struggling? Let’s say that we are doing this in the context of public speaking, something we can all relate to. If you were to define your A-game, B-game and C-game in public speaking, your A-game might be when you naturally rock the house and every joke gets a laugh, your C-game might be when you stutter, forget your lines and choke. If you were to chart all the times you owned the room, and all the times you choked, on a graph it might look like this, a bell curve. This bell curve shows the natural range that exists in your skill. No matter what the skill, even if you are an elite performer, you will always have aspects of that represent the peak of your ability, and the flip side, your worst. Always. There are times you play perfectly and other times that you don’t. The definition of perfection, or even just competence, is a moving target. As long as your skill evolves, that means you’re learning. If you’re learning, that means there’s range in the quality of your decision making. When looking more closely at your performance, for better or worse, it’s important to be honest about the reality of the range that exists. Not what you wish the reality to be, but what it actually is. Take a look at the strengths, represented by the right side of your bell curve. These are decisions that happen when your performance is perfect, so they come easily because you have a solid understanding of your craft. Generally, you have a great mindset and are in the zone. On the other side of the bell curve are all of the terrible decisions you make. These are all the mistakes you know you shouldn’t be making, but still do (With public speaking it would be forgetting your lines, stuttering, talking too fast etc). Often these are directly connected to mental game problems, such as your mind going blank under pressure, fear of failure or success, the yips, low motivation etc. Clearly, these are all the things you want out of your skillset because they not only do they cause problems in your job, but they create more frustration, confusion, and confidence problems. The concept of inchworm comes in when you look at how the range in your skill improves over time. A bell curve is a snapshot of a given sample, while improvement is the movement of a bell curve over time; something an actual inchworm illustrates perfectly in the way it moves. If you’ve never seen the way an inchworm moves, it starts by stretching its body straight, anchors the front “foot,” then lifts up from the back end, bends at the middle to bring the two ends closer together, anchors the back foot, and then stretches its body straight again. When you reach a new peak in your ability, the front end of your range takes a step forward. Your best just became better and that also means that your range has widened because the worst part of your game hasn’t moved yet. The most efficient way to move forward again is to turn your focus to the back end of your range and make improvements to your greatest weaknesses. 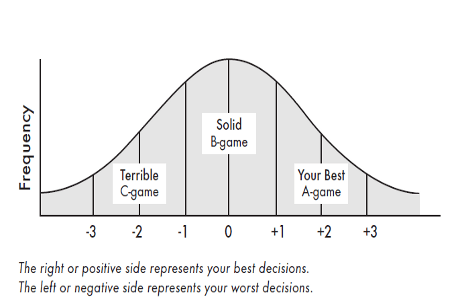 By eliminating what is currently the worst part of your game, your bell curve takes a step forward from the back end, and now it’s easier to take another step forward from the front. The common mistake most people make is working exclusively on the front end, their A-game. They want to learn how to do a handbrake turn when instead they should be working on making sure they can do a parrellel park first. Improvement happens from two sides: improving weakness and improving upon your best. Playing your best is a moving target because it’s always relative to the current range in your game. You create the potential for an even greater A-game when you eliminate your C-game mistakes because mental space is freed up to learn new things. This is all very important to know when you feel like you have taken a step back in your progress. You may have had a bad day at the office and felt like you have fallen back into old habits just because you didn’t perform your A-game. But if your C-game was not as bad as it previously was, that is genuinely a step forward, even if it doesn’t feel like it. I’ll leave you with one last piece of advice which I believe you can action right away and will have a profound impact on your improvement in any given skill. If you are unsure on what area of your skill to improve next, work on your biggest C-game mistakes. When you eliminate a C-game mistake, your B-game becomes your new C-game, your A-game becomes your new B-game and working on improving your A-game becomes much easier. Not only does this process become more structured, it is always much easier to identify what your biggest leaks are than your future strengths, because they tend to cause you more pain.